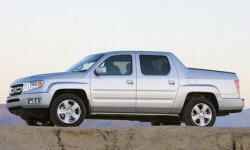 Hi, I'm looking at getting a 2009-2013 Ridgeline. First, can I assume the reliability with the engine, drivetrain, etc. is the same with any Honda? And second, how much of a difference is their between the RTL, RTS, and RT? I have a 2008 Ridgeline RTL that I bought new in 2007 which now has about 135K miles. I keep to the regular service schedule and it has been 100% reliable. The only issue I can think of is when it hasn't started due to a dead battery, but this is something that every vehicle is subject to. My batteries have typically lasted about 5 years (I'm in SE PA). The body has held up exceptionally well as had the interior. I'm on only my 2nd set of tires (Michelins) and may have another 10k of tread available before needing to be replaced. We have a 2006 ridgeline with 328,000km on it an it still looks and runs like it's brand new and it has seen some harsh winters here in Canada and has never let us down. We keep it well maintained through a dealer and have only changed the power steering pump and the timing belt kit recommended by Honda. We have no doubt that this vehicle will last another 300,000km. The different models only really pertain to stuff like power or heated leather seats, premium sound systems, dual climate controls, GPS or satelite radio, etc. Drive trains are all the same.